Back on December 21st, 2015, play­ers of Wizard of the Coast’s (WotC) pop­u­lar card game Magic: The Gathering (MtG) found some very un­usu­al news await­ing them un­der their Christmas tree: thir­teen judges from the Southeast re­gion of the United States had re­ceived 3 month sus­pen­sions from or­ga­nized play; this in­clud­ed the Southeast’s Regional Coordinator. Explanations soon fol­lowed, as the sus­pend­ed judges spoke out: WotC al­leged that the sus­pend­ed judges were be­hind con­tent leaks of pri­or sets that cul­mi­nat­ed in a mas­sive spoil­ing of newest set Oath of the Gatewatch con­tent. What fol­lowed this an­nounce­ment was a mix­ture of out­rage, in­creduli­ty, and calls to boy­cott WotC over what play­ers felt was a mis­han­dling of the sit­u­a­tion. “We are e‐mailing you re­gard­ing your Failure to Notify Wizards of the Coast of the Dissemination of Confidential Material. A re­port was filed and re­viewed by the an in­ter­nal in­ves­ti­ga­tion com­mit­tee. This group re­viewed the re­port and all of the state­ments from the peo­ple in­volved and have come to the fol­low­ing de­ci­sion.” -Email to Judges caught up in the sus­pen­sions. SuperNerdLand writ­ers cov­ered the sit­u­a­tion as it un­fold­ed, and now — over a month af­ter the af­fect­ed judges were un­sus­pend­ed — we sit down with one of those af­fect­ed judges to get an in­side look at just what hap­pened. That judge is CJ Shrader, long­time MtG play­er, judge, and co‐host of the pop­u­lar pod­cast JudgeCast. We are pleased to sit down with Shrader and hear his side of these events. More in­for­ma­tion on the sus­pen­sions and the sur­round­ing dis­cus­sions can be found in the SuperNerdLand ar­ti­cles linked above. So, let’s start off with an in­tro­duc­tion. Many peo­ple in the Magic com­mu­ni­ty know who you are, but some of our read­ers might not. Would you in­tro­duce your­self for them? My name is CJ Shrader, I’m a Level 2 judge from Smyrna, GA, I’ve been a judge for ap­proach­ing 6 years (Plus or mi­nus 23 days). I’ve been play­ing Magic on and off since Mirage (Author’s Note: 1996), and came back into the game se­ri­ous­ly around Zendikar (AN: 2009). Since then, I think I’ve al­ways been sort of a rule stick­ler (It’s not fun to play Monopoly with me) and so the rules as­pect of judg­ing al­ways ap­pealed to me. So, one day, I signed up to judge an SCG (AN: StarCityGames) Open (My first com­pet­i­tive event I’d ever been to! It was a dif­fer­ent time then. I had to go to a store to get a DCI num­ber just to take my Rules Advisor), I was test­ed, and I got my L1. I was also al­ways a fan of the pod­cast JudgeCast, which start­ed around the time I was in­ter­est­ed in be­com­ing a judge. Many years lat­er, I no­ticed the pod­cast wasn’t re­al­ly up­dat­ing and Jess Dunks and I both con­tact­ed Sean Catanese (one of the founders) about tak­ing it over. And thus, a leg­endary team was formed. Typically, what would you say your du­ties as an L2 con­sist of? The pro­gram de­scribes L2 judges as “area” judges. Where L1s typ­i­cal­ly are store judges and stick to one store, we tend to work with mul­ti­ple stores in the wider area. Generally I’d say the du­ties of an L2 are to head judge PPTQs (AN: Preliminary Pro Tour Qualifiers), work as floor judges at GPs (AN: Grand Prix), and train and men­tor judges to L1. And to put this on the record – WotC does not com­pen­sate you for judg­ing, cor­rect? Any com­pen­sa­tion comes from the Tournament Organizer (TO)? That is cor­rect. WotC doesn’t com­pen­sate us as judges, that re­spon­si­bil­i­ty falls on the TO. So if I work a PPTQ, SCG Open, or GP, the TO pays me. The one ex­cep­tion was PT Philly a few years ago, which I was on staff for. I was com­pen­sat­ed di­rect­ly by Hasbro for that event, as WotC is the TO for its Pro Tours. Had to sign a con­tract and every­thing. And most of the work that you, and oth­er judges of your rank and high­er do, is work that wouldn’t be com­pen­sat­ed? Training judges to L1, the JudgeCast, etc? Yep, I’m not com­pen­sat­ed for test­ing judges or JudgeCast. In fact Jess Dunks pays our serv­er costs out of pock­et. So, let’s talk about the Leadership group that WoTC blamed for a se­ries of leaks start­ing with Dragons of Tarkir, and most re­cent­ly for the Oath of the Gatewatch, as well as the events lead­ing up to the no­ti­fi­ca­tion of sus­pen­sion let­ters be­ing sent out. It is worth men­tion­ing that their lat­est ar­ti­cle did not say we were re­spon­si­ble for all the leaks, which I ap­pre­ci­ate. The lead­er­ship chat is some­thing that formed nat­u­ral­ly over time on Facebook. It con­sists of SE judge lead­ers and ba­si­cal­ly is just a group of friends more than any­thing. We pro­duce a thou­sand mes­sages a day talk­ing about…anything. It’s hon­est­ly rarely Magic, we’re not ex­act­ly pro play­ers. 1) I didn’t re­mem­ber this one and had to be told af­ter­ward, but we were giv­en a cou­ple of cards from Dragons of Tarkir on imgur links. They were al­ready avail­able on red­dit and had 100 views each, so these didn’t re­al­ly stick out. 2) There were a few cards from Magic Origins. The only one I re­mem­ber is the trans­form­ing Chandra. I don’t re­mem­ber if these went pub­lic or were al­ready pub­lic as I don’t ex­act­ly re­search where every card comes from. Once again, it’s not like these are the only spoil­ers we ever saw. 3) There were some cards from BFZ on drop­box links. I was at work so I nev­er ac­tu­al­ly saw these cards, as they’d al­ready been re­moved by the time I saw them. 4) I think every­one knows the next part, but we also got three spoil­ers from Oath of the Gatewatch. Those were Kozilek, Wastes, and Mirrorpool (I think). The first two were on twit­ter with­in 30 min­utes of be­ing post­ed in our chat, so at first we didn’t know they came from our chat but rather some oth­er source that had post­ed them around. Eventually, Hubble was able to de­ter­mine they did in­deed come from our chat di­rect­ly though. – A few days lat­er, a per­son from WotC (Not Helene or Hamer…someone we nev­er hear from) called Hubble and ef­fec­tive­ly start­ed mak­ing le­gal threats against him. This num­ber came from an un­known num­ber and Hubble had con­cerns about his cit­i­zen­ship, so he first said he got the cards from red­dit. – Hubble then called Justin Turner, our Regional Coordinator, and Turner was able to con­firm this was a le­git­i­mate call from some­one ac­tu­al­ly at Wizards and part of their fraud de­part­ment. – After that, Hubble got in con­tact again and this time co­op­er­at­ed ful­ly, an­swer­ing any ques­tions he was asked. Turner also co­op­er­at­ed ful­ly, and we were told to if we were con­tact­ed (We were not con­tact­ed). I know dur­ing this time, WotC also asked Turner for a list of every­one in the chat so that they could fol­lowup with us for more in­for­ma­tion in the in­ves­ti­ga­tion. I be­lieve Turner got a promise that there’d be no sanc­tions against us be­fore shar­ing that info. As we know now, that was a lie. Some time passed…a few weeks I think? Maybe a month? On December 19th, Hubble and Francisco got let­ters say­ing they were sus­pend­ed for 2 years. We thought the mat­ter was han­dled here, as we were nev­er spo­ken to. 2 days lat­er we each start­ed hav­ing let­ters trick­ling in over the course of a few hours. We were pret­ty sur­prised, to say the least. The threats lev­eled against Hubble…are you at lib­er­ty to say what they con­sist­ed of, and if any­one else con­nect­ed to him re­ceived threats of a sim­i­lar na­ture? I don’t know what was specif­i­cal­ly said to him. I sent him a mes­sage see­ing if he want­ed to ex­pand on that, but I’ll leave that up to him (AN: Hubble was con­tact­ed by Shrader but was un­able to re­call the ex­act word­ing of what was said to him by WotC, due to hav­ing been shak­en up by the in­ci­dent. An up­date to this in­ter­view will be amend­ed if and when he can re­call WotC’s state­ments). Was the “Godleak” of the Oath of the Gatewatch Expedition Lands/mythics also some­thing that was sup­pos­ed­ly the leadership’s re­spon­si­bil­i­ty? Those ini­tial ar­ti­cles sure made it sound like we leaked that too, but we sure­ly didn’t. I mean, if you think about it logically…we had a source for leaks, and one of those leaks got out. You think that guy would ever share leaks with us again? Of course not. We saw those cards at the same time as every­one else. The im­me­di­ate aftermath…I re­mem­ber there was a lot of anger from Turner, and a few oth­er judges, in the /r/magictcg threads dis­cussing the sus­pen­sions. I re­mem­ber Turner say­ing that he was go­ing to go pub­lic about their treat­ment, but that nev­er ma­te­ri­al­ized. Were the sus­pend­ed judges un­der some sort of gag or­der while you filed ap­peals? I be­lieve what Turner shared was that Aaron Hamer asked him to not dis­cuss this stuff pub­licly un­til af­ter the ap­peals were com­plete. Turner and many oth­ers agreed, as they felt that dis­cussing this pub­licly would hurt our ap­peal chances. So it wasn’t a man­date or any­thing, it was a choice we made. Now I re­mem­ber that bit from your pod­cast, about be­ing asked not to go pub­lic on the sit­u­a­tion un­til the ap­peals were han­dled. 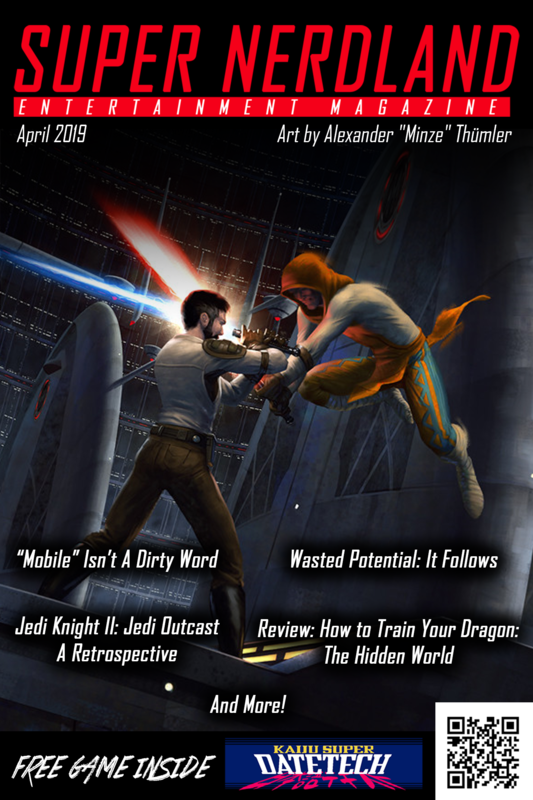 How do you feel the sit­u­a­tion was rep­re­sent­ed by WotC’s PR pieces? I seem to re­mem­ber you ref­er­enced a few ar­ti­cles that didn’t fair­ly rep­re­sent the sit­u­a­tion that end­ed up be­ing amend­ed af­ter some of the judges con­tact­ed WotC. Yeah, just to be ab­solute­ly clear we were asked not to dis­cuss it pub­licly, but it’s not like we were forced into it. I don’t want to act like they were threat­en­ing us, they just felt it would help our case in the long run not to dis­cuss it too much yet. The PR pieces…weren’t good. They la­beled us as thieves when we nev­er stole any­thing, and heav­i­ly im­plied we were re­spon­si­ble for mul­ti­ple leaks when we weren’t. Once again, I don’t re­al­ly blame Helene for that…she didn’t do the in­ves­ti­ga­tion and I have a strong feel­ing there was a lot of mis­in­for­ma­tion be­tween the di­vi­sion of WotC that in­ves­ti­gat­ed us (Legal? I’m not sure. It wasn’t the Player Investigation Committee is all I know) and with the “faces” of WotC. Do you think that the sus­pen­sions prox­im­i­ty to Christmas was an in­ten­tion­al move by WotC, in an at­tempt to de­lay ad­dress­ing the sit­u­a­tion? 1) WotC knew we were go­ing to get sus­pend­ed, and thought maybe we wouldn’t have any events those last two weeks of December any­way, so they were ba­si­cal­ly giv­ing us a two week “re­duc­tion” on our sus­pen­sions? Since if the sus­pen­sion didn’t hap­pen then it prob­a­bly wouldn’t hap­pen un­til January. So this idea would be mis­guid­ed, but at least it’d been made with good in­ten­tions. 2) WotC knew that the com­mu­ni­ty is quick to let is­sues blow over, and do­ing it over Christmas would give peo­ple plen­ty of time to just for­get about it and move on as they do. This seems like­ly, but at the same time I just don’t know if they are that ma­li­cious. Obviously if this was the plan then it back­fired. There was some­thing I was a bit con­fused about, in your pod­cast. You men­tioned that the Judge Conduct Committee (JCC) also sus­pend­ed you guys from judg­ing, which ap­par­ent­ly they shouldn’t have done? Can you elab­o­rate on that, or tell me if I’m off base on any­thing? So there are two sus­pen­sions a judge can go through, though usu­al­ly one re­sults in the oth­er. 1) A WotC sus­pen­sion. This means we can’t play in or judge events. Basically, it’s WotC’s ball and they can take it away if they want to. 2) A judge sus­pen­sion. At this point we’ve gen­er­al­ly lost the abil­i­ty to judge events, but this sus­pen­sion re­moves our abil­i­ty to par­tic­i­pate in judge pro­grams and projects, in­clud­ing the judge fo­rums. It is our opin­ion that this sus­pen­sion should not have been ap­plied to us, as we did not do any­thing ma­li­cious and we were nev­er in­ves­ti­gat­ed by…anyone, re­al­ly. You can read the head of the JCC’s thoughts on the sus­pen­sion here for a dif­fer­ent view. Now that it’s been al­most a month since you and oth­er judges were un­sus­pend­ed, how do you feel about the fu­ture of the Judges pro­gram, and for MtG in gen­er­al? Do you think these bans set any kind of prece­dent that we as play­ers or judges should be wary of? If you’d asked me a month ago, I prob­a­bly would have giv­en a worse an­swer. I ac­tu­al­ly don’t think WotC will let some­thing like this hap­pen again. There will al­ways be leaks, and the peo­ple who at­tempt to spread them pri­vate­ly to their friends will al­ways be the ones to be pun­ished. The peo­ple who hide be­hind anony­mous user­names (ie, the true ones caus­ing a prob­lem) and post­ing them on­line will al­ways get away with it, be­cause vague threats can’t solve those prob­lems. But at the same time, I re­al­ly want to be­lieve that over­re­ac­tions on this scale sim­ply won’t hap­pen again, that the busi­ness will learn to talk to it­self a lit­tle more. 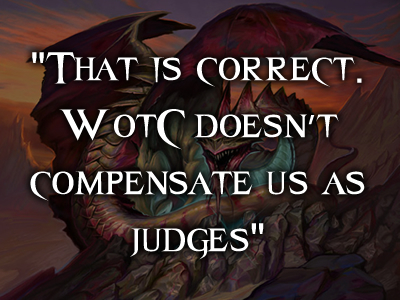 That be­ing said, WotC has said they will com­mu­ni­cate more with us (judges specif­i­cal­ly, but even play­ers). I don’t be­lieve it and I don’t think it will hap­pen. I don’t think they will mag­i­cal­ly start us­ing the Regional Coordinator Advisory Committee, and I think they will con­tin­ue to make de­ci­sions and qui­et­ly sus­pend peo­ple for made up rea­sons. They just won’t do it again for leaks. With this in mind, what are some things play­ers and judges can do to pre­vent sim­i­lar treat­ment in the fu­ture? Wizards would say you should re­port spoil­ers as soon as you see them. I don’t think this is a player’s re­spon­si­bil­i­ty nor is it a rea­son­able re­quest. I also don’t think it’s a judge’s re­spon­si­bil­i­ty as we are not WotC em­ploy­ees. So if you’re not will­ing to do that…nothing can pre­vent sim­i­lar treat­ment. We just have to have faith that WotC will not do this in the fu­ture be­cause they said they wouldn’t. If they do, we have to re­act loud and strong­ly like we did this time to show WotC we are dis­pleased. They will try to ig­nore it at first, they al­ways do, so it has to con­tin­ue un­til they can’t ig­nore it any­more. Most Magic “con­tro­ver­sies” blow over in about 3 days, and that’s be­cause of us (the com­mu­ni­ty) just find­ing some­thing new and los­ing in­ter­est. If you’re un­hap­py, con­tact twit­ter and cus­tomer ser­vice and let them know. I’m sure post­ing on Reddit just isn’t enough. Got a lit­tle ram­bly there but I hope that gets the point across. Any last words for the peo­ple read­ing? I think I’ve been neg­a­tive enough. I just want to thank every­one for all the sup­port, it re­al­ly meant a lot to all of us sus­pend­ed. Some peo­ple are still sus­pend­ed, I don’t want to for­get about them, but I can’t thank every­one enough for all the kind words, mes­sages, and posts we saw dur­ing that time. Without those, we prob­a­bly would have quit a week into it and just been done with the en­tire thing, but see­ing that peo­ple cared re­al­ly meant a lot. For ad­di­tion­al views on the sus­pen­sions, JudgeCast has an episode ded­i­cat­ed sole­ly to the sus­pen­sions, guest star­ing the Southeast Regional Coordinator Justin Turner, and can be lis­tened to here.